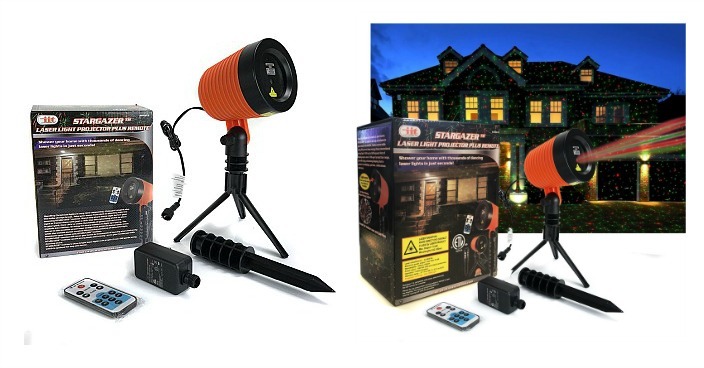 StarGazer Laser Light Holiday Projector Just $37.99! Down From $75! You are here: Home / Great Deals / StarGazer Laser Light Holiday Projector Just $37.99! Down From $75! 13 Deals has this StarGazer Laser Light Holiday Projector on sale for $37.99 (Reg. $75)! Bring the brilliance of the stars to your home. StarGazer is easy to set up and showers your home in beautiful, festive stars while using 99% less energy than conventional string lights. With up to 600 square feet of display space and a 100 yard projection range, you will enjoy a stunning display that is perfect for holidays, parties celebrations and more. Using the included infrared remote control you can cycle through the 9 different patterns and apply different colors to the patterns. Includes a tripod and lawn stake depending on your installation needs. Weather-Proof construction means it’ll be around for many holiday seasons to come!